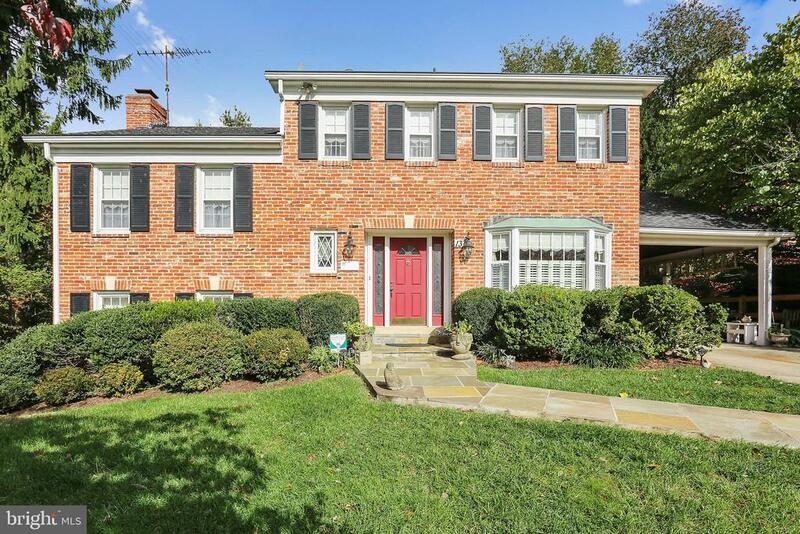 At the top of a cul-de-sac sits this lovely split-level home, one of only a few all-brick colonials in College Gardens. Enter the foyer and the kitchen is to your right, with a bright breakfast area, built-in desk, and plenty of storage. White appliances include a built-in microwave, and a ceiling fan keeps you cool while you cook. There is also an exit to the carport so you can stay dry to and from your vehicle. An open floor plan on the rest of the main level gives it an airy feel. There is a large living room and dining room with chandelier, recessed lighting, and a half-moon window. The sun room addition is a fantastic place to entertain guests. One level up are two bedrooms with an adjoining Jack and Jill bathroom. One bedroom has extensive built-in shelving and the other has a custom Elfa walk-in closet. The upper level has three more bedrooms and a full bath with double sinks in the hall. Below the main level is a large family room with white paneled walls, a brick, gas fireplace with mantle and hearth, and a sliding door to the back patio. The laundry room is also on this level. The bottom level is a partially finished storage area with an extra fridge and workshop. This is a great opportunity to live in an established, walkable neighborhood close to parks, downtown Rockville, and commuter routes!